Spring has sprung all across NYC! That marks the arrival of the busiest season of the year for the Union Square Partnership. USP invests in the improvement, beatification and maintenance of the neighborhood year-round, and our team works especially hard to make sure our community is bright, beautiful, and blooming for the spring. Watch how we transform the district with signature green bistro furniture and teal umbrellas, flowers and plants in the Park and district pots, colorful lamppost banners, fresh coats of paint, and more. Read on to check out our spring projects in action, led by the Union Square Partnership Clean Team. All season long, from April to October, the Union Square Clean Team is boosted with extra hours and additional staff members, to keep the district clean and beautiful, and allow extra time for spring and summer projects. It may seem like Union Square flowers pop up in the blink of an eye, but USP invests a lot in landscaping to ensure the district is fresh and colorful for the new season. After weeks of clearing brush, pruning shrubs and adding new mulch, you can now find our landscaping crew out in the park planting beautiful violas, tulips, pansies and other colorful flowers, plus fresh greenery along the park's most popular walkways and monuments. Also find spring blooms in 90 planters around the district, along 17th Street, in the Broadway Pedestrian Plaza, throughout Union Square Park's walkways and plazas, and in hanging pots on light poles. After cold winter months, the park’s Center Lawn could use some extra TLC. Our landscaping team re-seeds the lawn so it can sprout fresh grass for you to enjoy all season long. Plus, watch as the median malls along Union Square East bloom with lush green leaves, thanks to the 80 columnar trees planted by USP two years ago. Looking for a spot to enjoy al fresco lunch or an outdoor meeting with coworkers? Take a seat in any of five seating areas around the park on our signature lime green bistro tables and chairs. USP purchases and stores the furniture all winter long, and our Clean Team gives the tables and chairs a deep-clean at the start of the season. They work to set up the seating daily and lock it up each night, keeping the equipment in great condition for the community to enjoy. Find seating on the Center Lawn, the West Side at both the 15th and 16th Street Transverses, the West Plaza at the James Fountain, and the Broadway Pedestrian Plaza at 17th Street. Can’t wait for summer? We’re excited too! Look up as you walk through the neighborhood to spot our district banners, adding a pop of summer color to the skies. What better way to tie together the district than with colorful banners showcasing the support of our neighborhood partners? These 70+ banners serve as a welcome to the community, and as a reminder of our summer-long event series Citi Summer in the Square. Join us in Union Square Park for free fitness, kids', and performance events every Thursday from June 13th - August 8th. The USP Clean Team is working this season to freshen up the neighborhood with a paint job and a fresh coat of color! Find them repainting fences, tree guards, and street elements while they remove any graffiti tags on public amenitites. This season, we’re throwing only good kinds of shade in Union Square Park! As you lounge on bistro furniture, enjoy the shade of USP’s signature teal umbrellas, adding pops of color all around the park. Our Clean Team works each morning to set up and secure the umbrellas, and disassemble and lock them up each night. 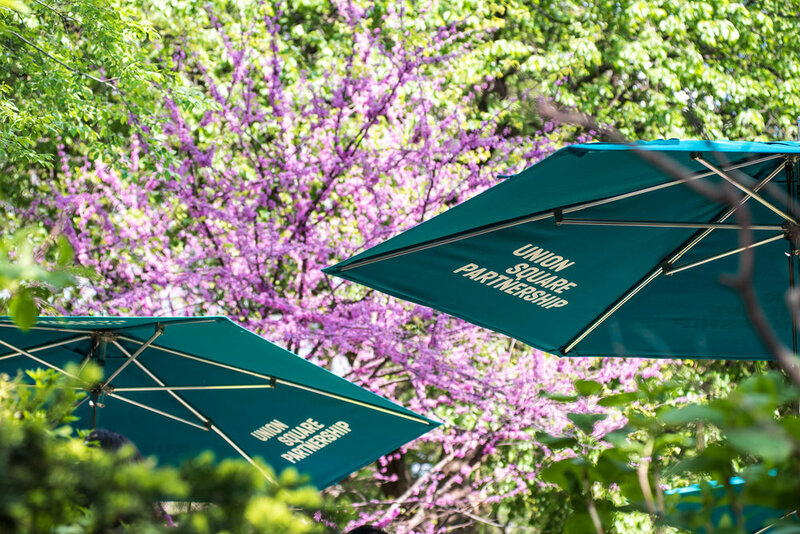 Find umbrellas in our five seating areas, plus throughout the Union Square Dog Run, providing shade for our furriest park-goers and their owners. Follow along on Instagram and Twitter to see how we're making Union Square bloom at #USQBlooms. Share your photos of our work and we'll feature our favorites! Check out some of the best #USQBlooms below. Oh happy day! Newly planted #pansies at Union Square!